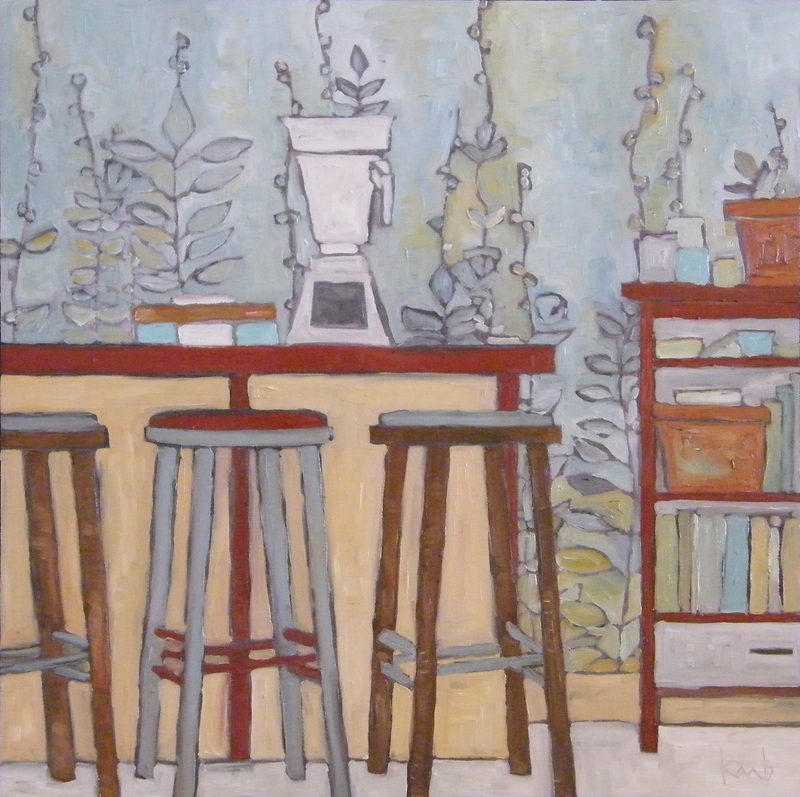 Special thanks to friends and family who’ve asked me what I’ve been painting lately…your remembering my love of creating warms my heart and has made the time pass till I can break out my paints once more. 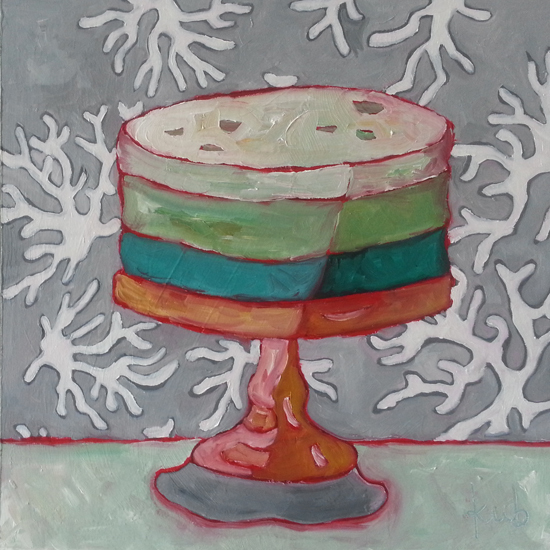 I’m happy to report that last weekend I bought some new paint and began a new artful project. 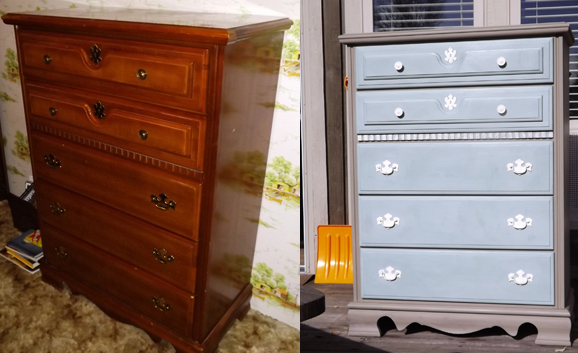 For too long I’ve saved images, dreaming of beautifully restored furniture pieces painted in new colors, giving them new life and making them a bit more contemporary in the process. 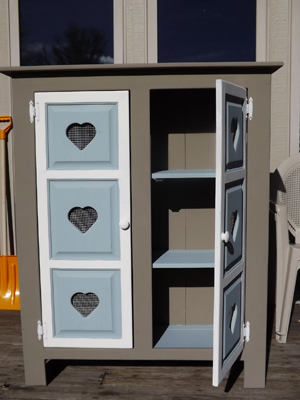 Because it was my first attempt, I wasn’t quite sure what to expect and used 2-3 coats of duck egg blue, coco & old white everywhere…including the hardware. Then we polished it with the clear wax. When the designer came home, he was so impressed that he helped me haul the pie safe up and outside to the wood-shop…Grandpa Berg and Tyler’s wood-shop…I mean. 🙂 It was nice to spend the weekend in there thinking of all the joy that was found working in that wonderful space. Together we planned and painted the pie safe with the same color scheme (as they are the only Annie Sloan paints I have so far). 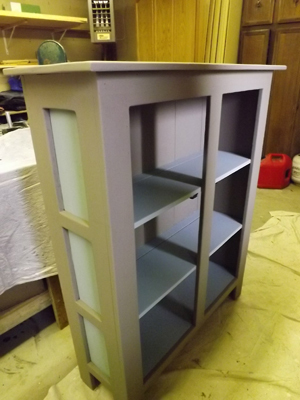 This time around we used one coat of duck egg blue and coco…the old white needed about 1 1/2. They are just gorgeous! Great job! PS I’d love to see more of our projects! Thanks for sharing! I love those colors, hypothetical if you were to paint a bathroom with those colors what type of shower curtain would you get? hmmm, such a very good question Sonya (luv your blog btw, you are a beautiful writer)…we recently bought 3 salvage sinks, $5 each. Two are white and 1 is an old yellow…not quite mustard…a retro yellow (maybe close to Annie’s “versailles”) that would actually really look good with the paint colors in these two pieces…I’d probably pick a shower curtain with a bit of red (close to “emperor’s silk”) and a bit of that “versailles” yellow…lots of white and grey and the duck egg blue…preferably in a retro print to go with the old sink. How about you? I actually painted my downstairs bathroom with the same grey and a light pink color, the trash can and the toothbrush holder are that grey blue color, but our shower curtain is a dark blue. Dark blue might work if it was divided up with some neutral color, but it honestly looks horrible in the bathroom as it is. It detracts from the paint job, and it dwarfs the room. The best shower curtain I have been able to find has the same grey, the top and bottom have a thick strip of black (it’s really pretty don’t get me wrong, it just doesn’t work in there either). I think I might look into yellow (I hadn’t even thought of it), but we basically have Easter colors going on in that bathroom maybe it would finish the set! Thank you for your help! I absolutely love those colors together I want to find a chest of drawers and paint them the same colors as you have. $15 for three sinks? That is amazing, are you remodeling your entire house – bathrooms or do you just buy what you can find then put it somewhere? Oh wow, you’ve tried a lot already in that bathroom :). Easter colors hee hee. Totally understand. Let me know how the yellow goes…sometimes it just takes a while living in the space and seeing just how the colors make you feel. We are currently building a home…it’s modern and as green/sustainable as we can afford right now. Inside will be an eclectic mix of salvage, hand-me-downs and industrial touches I think so far. We found all of our doors at a couple local recycle centers and I’ll probably paint them each a different color or mix some of Annie’s paint to get different variations of the same colors. Looking forward to seeing your future dresser :)! Wow, that sounds like a lot of work… but rewarding in the long run. I think there are some amazing things people can do with “another man’s junk,” part of me can’t understand paying full price for anything now-a-days. Sustainable and green, that should end up saving your family a lot of money too. I agree I think I will just play with the colors and see what works in there. If I could find a light yellow that might be best, I am finally excited about finishing this project, that shower curtain became a major road block for me. 🙂 I think it will be a long project that we’ll work on for years, but I’m looking forward to it. Hoping your shower curtain comes on long much quicker lol. Looking forward to hearing what you choose! HAHAH I hope so too, but you never know! 😀 I will let you know what we decide to do. ASCP is so new to me…just getting the lingo :). Thx so much for your link, heading there right now…oh wow. Anyone looking to do some distressing, check out Arzea’s link. Not only did she pick a huge piece to start with, she did a beautiful job and gives lots of description as to how it all went down. You’ve inspired me girl! What an excellent hobby that you got! What a cool endresult: so classy too! 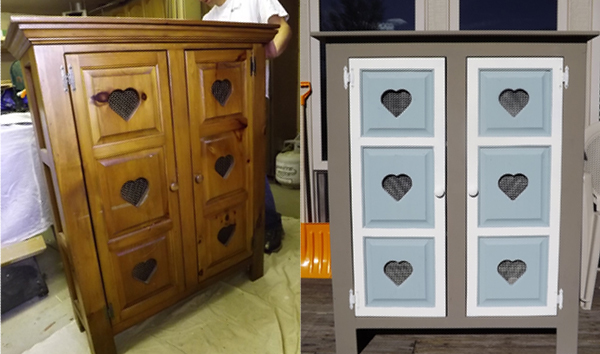 Love your new furniture paint jobs Katrina. Haven’t tried that paint, but it sounds nice. Sounds all very exciting building the new place. Happy holidays.